Kefir - the most common and affordable means for hair care at home. It contains protein and calcium, yeast, lactic acid sticks, vitamins B and E, which perfectly nourish the hair, strengthen and restore their structure. Kefir perfectly softens and moisturizes dry hair, prevents their fragility, eliminates loss. It also forms a protective film on the hair, protecting them from the negative impact of the environment. When caring for dry hair, hair masks from kefir are just a panacea. When using kefir masks, it should be remembered that this product washes the pigment from the hair. Therefore, with dyed hair, the paint is partly washed off from them and it is undesirable to use these masks. At the same time, this property of yogurt can be used when lightening hair. However, while doing this, do not expect to receive a dazzling blonde. But this method is more healthy in comparison with the burning of hair with hydrogen peroxide or other aggressive methods of chemical exposure. The easiest option - smear yogurt hair and roots, warm the head with cellophane and leave for an hour, you can longer. After kefir mask, wash your hair with shampoo. With regular application, the hair will become obedient, silky, dry dandruff will disappear. Some women prefer to wash their hair with kefir instead of shampoo. However, this option is suitable only for owners of very dry hair, since kefir makes the hair heavier, they get dirtier faster. 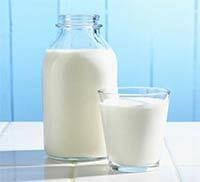 Kefir is often used as a part of masks in the treatment of hair loss . It perfectly dissolves brewer's yeast, mustard powder, essential oils. To increase the effectiveness of yogurt, you can compose your own recipe for a curative hair mask, adding to it any of the following ingredients: yolk, mustard , pepper tincture , burdock oil, honey, onion juice, cognac, broth from herbs (nettle, burdock, ayr) and etc. Kefir mask with mustard for hair growth. Stir a tablespoon of dry mustard in 150 ml. kefir, add 1 yolk, 1ch.l. honey and almond oil (can be burdock). Add a few drops of essential oil (rosemary, lemon or other) into the mask. Apply the mixture on the hair, put on the cap and leave for half an hour. Wash your head thoroughly with warm water and shampoo. Kefir mask with oils for dry hair. Stir thoroughly 3 tablespoons. kefir with 1 tbsp. castor, burdock or olive oil and 1 egg yolk. To put on hair, to wrap up a head a polyethylene film and a towel. Hold for 1 hour, then rinse with warm water and shampoo. Kefir mask for all types of hair. In boiled milk, cooled to room temperature, add 2 tsp. kefir, mix and put for 1-2 days to brew in a warm place. The mask is applied to clean damp hair and left for half an hour. After that, it is washed off with water without shampoo. Kefir mask for hair growth with onions: squeeze juice from one onion, mix it with a glass of kefir. If desired, a teaspoon of burdock oil and 1 yolk can be added to the mask. Distribute the mixture over the hair, warm the head and leave the mask for an hour. Rinse with warm water. In the kefir mask, the smell of onion is almost imperceptible. Kefir mask with egg. Mix half a cup of yogurt with 1 tsp. castor or burdock oil, add 1 egg yolk. Apply the mixture on the hair and put on the cap. In an hour, wash your hair with a shampun. Kefir with nettle (burdock). Prepare a decoction of nettles or from the roots of burdock. Mix the broth with kefir in equal proportions and apply to the hair for 1 hour. The mask helps with dandruff and enhances hair growth. Nourishing kefir mask with blue clay. 1 tbsp. cosmetic blue clay stir in half a glass of yogurt and rub into the roots of the hair. After half an hour, wash your hair with shampoo. This mask is ideal for oily and normal hair, perfectly nourishes them, gives volume and healthy shine. Kefir mask with bread against dandruff. Half a cup of yogurt take a little crumb of black bread and 1 tablespoon. vegetable oil. Mix well and apply on the head for 20 minutes. Then wash your hair. In order that kefir masks bring maximum benefit to your hair, do it at least 2 times a week for 2 months.